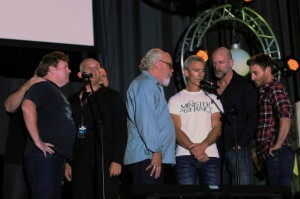 “The first HobbitCon last Easter was such a fabulous event that there will be another one this year, much to the delight of the many fans who wished for this happen. Incidentally, the eight Dwarf actors who were among the ‘star guests’ last year enjoyed themselves so much that they are all returning for this one! Anyone interested in reading about our impressions and adventures at last year’s HobbitCon can read more at the message boards, in a thread started by Rosie-with-the-ribbons on the ‘TORn moots and other events’ board. Although the convention takes place in Germany (at the Maritim Hotel, Bonn), it’s the only international event of this magnitude that focuses exclusively on The Hobbit and other Tolkien-related topics, and according to the HobbitCon organisers, the majority of those who have already bought tickets come from all over the world — other European countries, Russia, America, and even Japan! and Mark Atkin, who is Richard Armitage’s stunt double as Thorin. 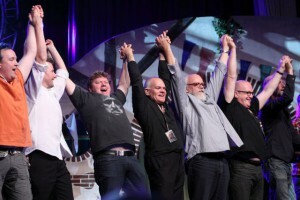 All the actors will be on stage several times in their respective panels and, in some cases, in a couple of comedy shows as well, which, if they are anything like the one last year, will have the audiences in stitches throughout. Moreover, WETA Workshop’s creative genius Sir Richard Taylor will be giving two talks and two workshops in which he’ll transform a volunteer member of the audience into a Middle-earth creature! Also present will be Royd Tolkien, J.R.R. Tolkien’s great-grandson, who’ll give two panels, and Emil Johansson, the creator of the LotR Project, who’ll talk about The Science of Middle-earth, The Hobbit book and the movie. Mark Ferguson (who played Gil-galad in The Fellowship of the Ring) will again act as Master of Ceremonies in his inimitable style. Larry D. Curtis, TORn’s own MrCere, will give several talks on The Hobbit and his experiences as an embedded reporter on the film set in New Zealand. In the Choir Workshop, held in English and German, you can learn the ‘Song of the Lonely Mountain’. A number of talks and workshops on a great variety of topics will be held in German, but several of the workshops will be conducted in both English and German (as indicated by the small letters ‘E’ and ‘D’ in the respective boxes in the schedule). The film The Hunt for Gollum will be shown at HobbitCon, and the fan fantasy project Myrrdin will be introduced in a panel and a workshop by the film makers. Another screening will be of the Russian film parody The Trouble of the Rings Returns King Size (in Russian with optional English and German subtitles). The Deutsche Tolkien Gesellschaft (DTG, that is the German Tolkien Society) will have their own rooms and separate activities. Last year, among other things, they offered a Tolkien quiz (and I, with considerable help from Rosie-with-the-ribbons, won a small plastic collectible figurine of Grinnah the Goblin). On Saturday and Sunday evening there will be parties and a concert; a Costume Contest is scheduled for Sunday evening, and there will be an Art Show featuring Tolkien-related fan artwork. Many sellers will offer merchandise galore, and you can get autographs and be photographed with your favourite actors (or all of them at once in a group photo) — lots of opportunities to spend money! Thanks to kiwifan for sharing her thoughts and excitement! If you’re planning on going, and would like to meet up with other ‘TORnadoes’ whilst you’re there, you can always head on over to the message boards and start a thread to find out who else will be there!